When the atomic bomb exploded over Hiroshima on 6 August 1945, it precipitated a nuclear age that shaped the Cold War and post-Cold War periods. 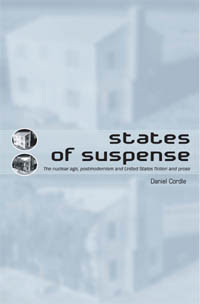 States of suspense is about the representation of this nuclear age in United States literature from 1945–2005. The profound psychological and cultural impact of living in anticipation of the Bomb is apparent not only in end-of-the-world fantasies, but also in mainstream and postmodern literature. This book traces the ways in which key motifs – the fragility of reality; the fear of closure; the inadequacies of language to represent the world – move between nuclear and postmodern cultures of the Cold War era. Taking three symbolically threatened environments – the home, the city, the planet – the book explores their recasting as ‘nuclear places’ in literature, and shows how these nuclear concerns resonate with those of other cultures. For more information, including how to order, click on the title above or here. Get in touch if you are interested in an inspection or review copy. Category: History, Literature	0 Comments.